My newest calendar for 2011 features the seventeen winning poems from the 2010 Nora Purr-etry Contest. It also has all-new images of me. And check this out: the poems were written by my fans from around the world – as far away as South Africa and Australia. The photographs are by my personal assistant and chief photo guy, Burnell. 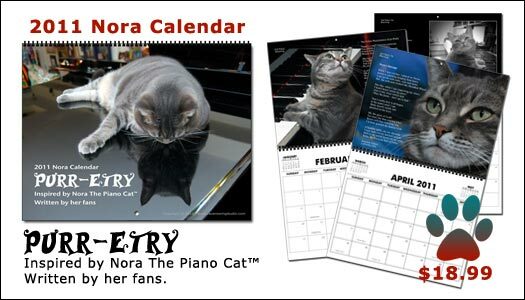 Note: Authors of the seventeen winning entries each receive a 2011 Nora Purr-etry Calendar as part of their prize package. Nora you are one very special and wonderful cat! Wow! I’m so pleased to be getting this beautiful calendar as a prize for writing the 2nd best Haiku in honour of Nora. Thank you, thank you, thank you, Nora. I can hardly wait to see the calendar and am so lucky and honored to be included. My name is Debbie. I just love your cat Nora. She looks exactly like Sheik, who died one year ago. She could be his brother. I do have another cat now named Spooner. I was wondering if you are accepting any more poems about cats. I have a great one about my Spooner that I’m sure you would enjoy. Pleae let me know. Anyways, give Nora a great big kiss and tell her she is purrfectly fabulous.